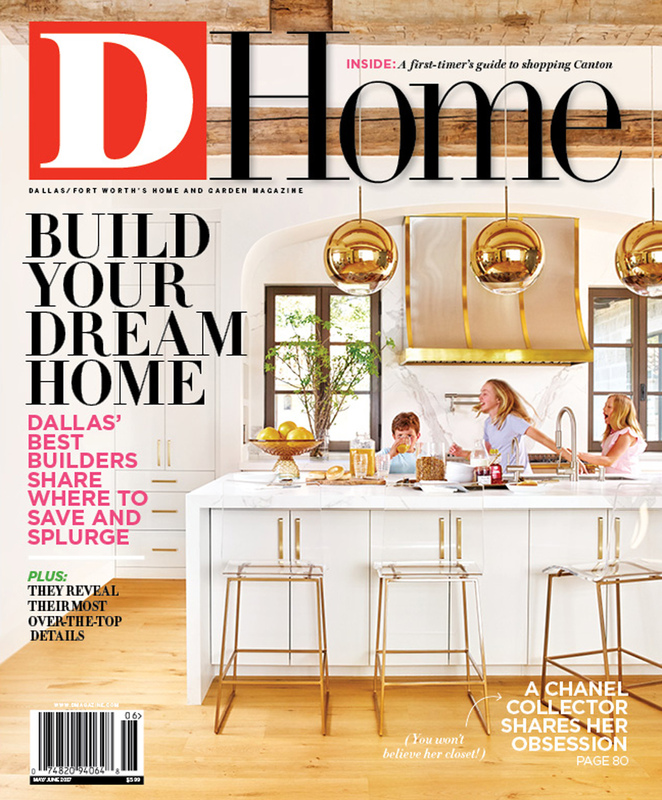 By D Home | 2 years ago The city's most talented, experienced professionals share where to save and splurge in the home-building process. Plus, a look at what's trending in the local market. By Connie Dufner | 2 years ago A stunner blooms under the visionary direction of a team that clicked. By Rob Brinkley | 2 years ago How a family came together to create an empty-nester couple’s paradise. By Ryan Conner | 2 years ago We fell in love with this Highland Park collector and her secret obsession. You'll see why. By D Home | 2 years ago They are sure to be a hit. By Sarah Bennett | 2 years ago Wrapped up in leather, a good vintage piece can go from dated to dashing—without a hint of western. By D Home Staff | 2 years ago Set the tone with bold legs and pedestals. By Jessica Elliott | 2 years ago Rick Janecek produces a collectively eclectic cast of handsome home furnishings. By Nancy Nichols | 2 years ago These six spots clock in under a two-hour drive. By D Home Staff | 2 years ago Blend in some Havana brights. No passport required. By D Home Staff | 2 years ago Trends follow the pattern play from this season’s ready-to-wear looks. By D Home Staff | 2 years ago Clay all day. By Sarah Bennett | 2 years ago See Jimmie Henslee's wonderful watercolors on a coffee table near you. By D Home Staff | 2 years ago Here’s a quick look at just how far your money will take you in local real estate. By Ryan Conner | 2 years ago A Dallas couple started following a home on Instagram. Here’s what happened next. By Sarah Bennett | 2 years ago In her fifth book, the author is seeing life through rose-colored glasses—and blue and green and purple. By D Home Staff | 2 years ago From spices to spaces, check out what these stores have to offer. By Ryan Conner | 2 years ago A beauty trend comes to Dallas through this local purveyor.